We spent the first half of this week’s show discussing the flood of charges from area prosecutors aimed at 1) a group of eight alleged heroin dealers; 2) Mayor Lee Lansing, and 3) Victor Summa. The rest of the show was devoted to the upcoming Fiber Optic Feasibility Study and the City’s Nov. 6 open house on the subject. Our guest: Melissa Reeder, IT director for the City of Northfield. 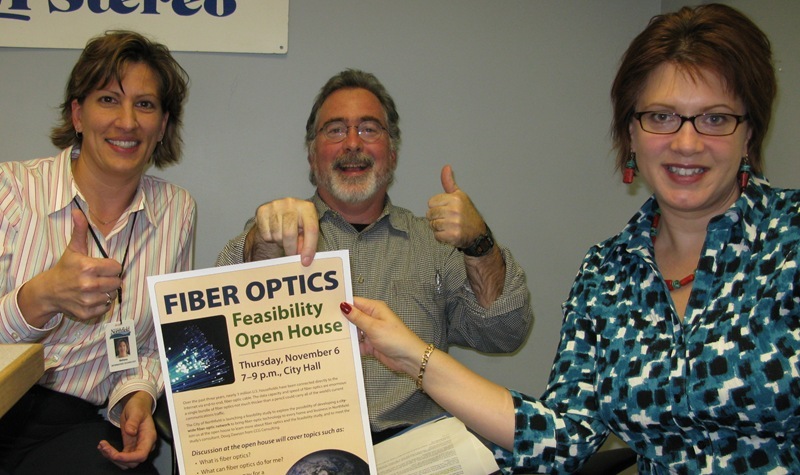 The November 6 open house will provide an informative, interactive opportunity for residents to learn more about fiber optics; what the technology can do for an individual, family, business or community; alternative methods of financing the infrastructure; and ownership and service provider scenarios. Our radio show/podcast, Locally Grown, usually airs Wednesdays at 5:30 PM on KYMN 1080 AM and on Fridays at 4 PM on KRLX 88.1 FM. An item we didn’t discuss in the podcast was the survey portion of the feasibility study that will be directed specifically towards the businesses in Northfield. Doug Dawson, our consultant from CCG, wants to visit with key stakeholders and decision makers in our business community. The discussions won’t be done at the Open House; however this would be a perfect place to make those contacts for later follow-up. We need to learn how businesses make their bandwidth buying decisions and if there is a chance for the City to be a vendor. We’d like to hear what they would do with a really big data pipe! Are there businesses in Northfield who have struggled with the bandwidth constraints offered in this town? Is this a key issue in relocating or staying in Northfield? The other item we didn’t even begin to discuss is the “green” opportunities that fiber optics can offer. Imagine if some of the commuters from Northfield to Metro could work from their home once a week? Maybe even twice a week? The positive environmental impacts are very measurable! Thanks, Melissa. I’ll be there today. Good to see your PDFs lined up on your fiber open house page. Wow – what a great showing at the open house last night! I counted about 40 people! The questions were wonderful. Doug Dawson from CCG had an active audience for about 90 minutes. In addition to on-the-spot answers, he shared what other US cities and countries are doing with their ultra high speed lines. Some people wanted to participate in the survey process at the open house. We value all feedback, but to get a true statistical sample on the feasibility of a fiber optic system, the survey will be conducted at random via telephone. Stay tuned – you may be called. The citizen telephone survey will begin before Thanksgiving. One last item – calling business and business property owners! If you would like to participate in the business survey portion of the study, please contact me. We want to hear what you have to say! Thanks for the update, Melissa. I’ve blogged the photo album of the meeting, along with photos of the flip charts.